Many in Southern California found ways to beat the record-setting heat that swept through the region over the weekend, and that wasn't just limited to humans. 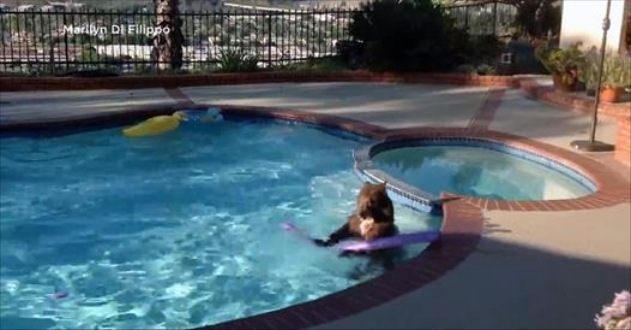 ABC7 viewer Marilyn Di Filippo shared video of a bear taking a swim in her swimming pool in Bradbury on Sunday. Shannon Lievense said she was visiting her parents' home for Father's day when she noticed some footprints near the pool. That's when she spotted the bear run from around the corner and jump into the pool. "He continued to play around for about 20 minutes. We watched him play with the different rafts and my baby's pool toys," Lievense said. Lievense said bears frequent the San Gabriel Valley neighborhood, and residents know to give them space. Temperatures in the Palm Springs area reached nearly 120 degrees. The heat was expected to linger in the region through Tuesday. Responses to "Bear makes trespassing cute by jumping into a private pool"
So glad this bear found a way to stop suffering, and glad these people understood.